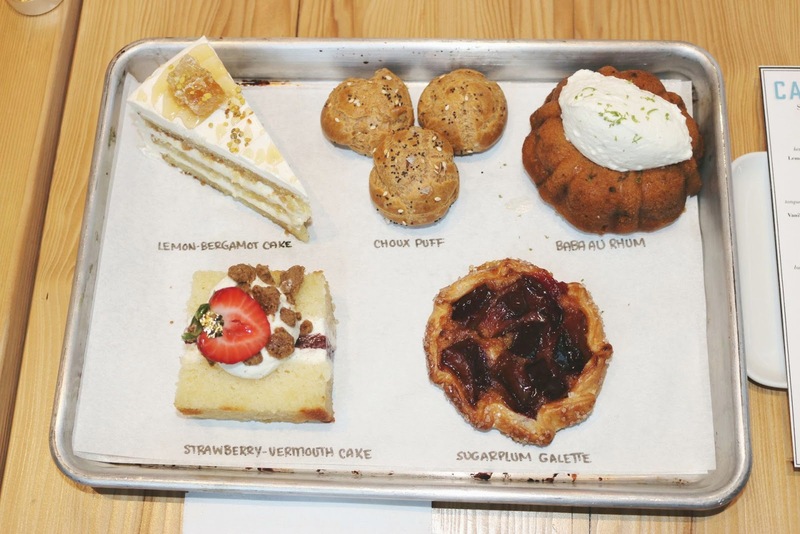 After a self-proclaimed "quarter-life crisis" led Lily Fischer to quit her teaching job, she enrolled full-time in the Philadelphia Art Institute's Pastry program. 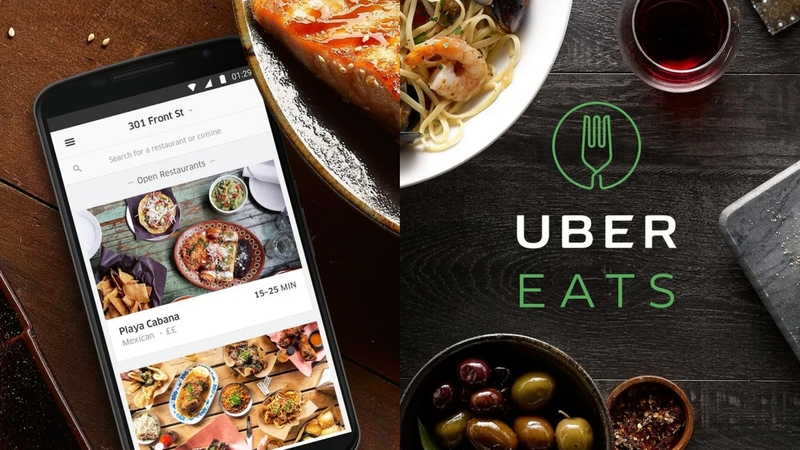 Cut to four years later, Fischer won Food Network's Cup Cake Wars and subsequently teamed up with her best friend, Nima Etemadi, to open up Cake Life Bake Shop. Located in Fishtown a block from hotspots Fette Sau and Frankford Hall, Cake Life is a gorgeously lit all-day cafe and bakery. 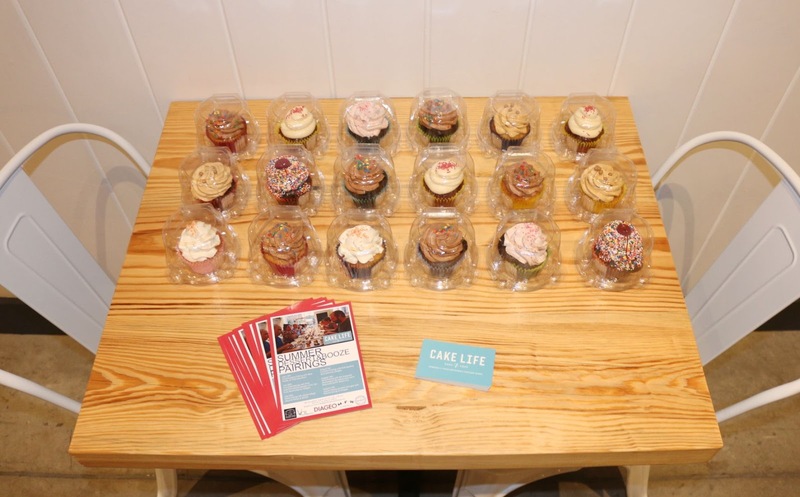 It's the perfect spot for coffee, tea, and of course, a myriad of cakes, cupcakes, and other dessert fare. Bottom Left: Cake Life Co-owner Lily Fischer holding court with Fri-Sat-Sun Bartender Paul MacDonald. 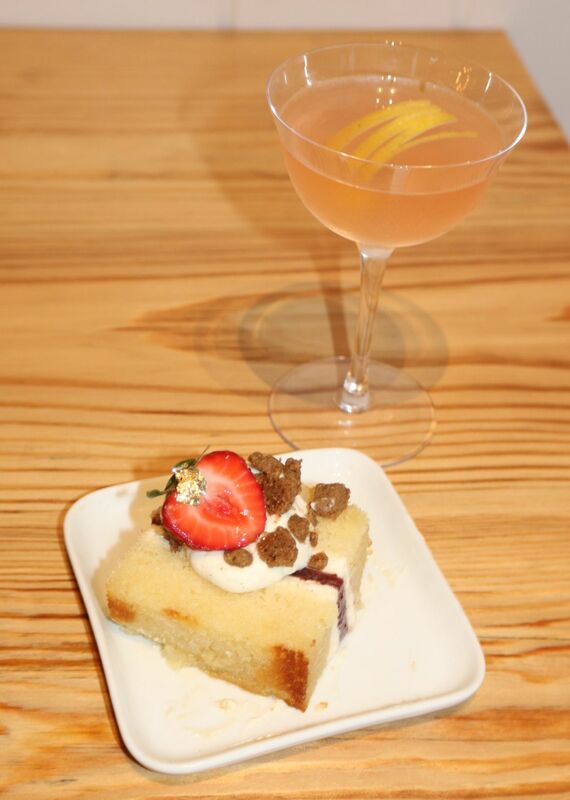 And this summer, Cake Life is offering up an innovative dessert and beverage pairing series! 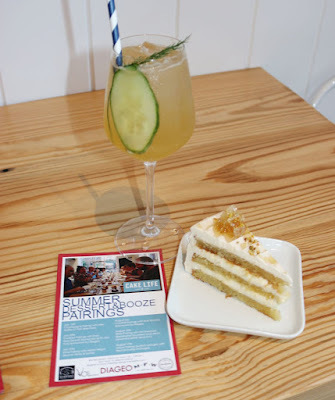 Every Thursday night through August 17th, Cake Like will be joined by a beverage expert to produce a flight of five pairings. Tickets are $55 pp and can be purchased here. I recently stopped by their cocktail pairing sponsored by Diageo, where reputed Friday, Saturday, Sunday bartender Paul MacDonald whipped up some great cocktails with some of Cake Life's off-menu creations. The night begins with all your desserts presented at once. Essentially a master class in restraint as you wait on the respective pairings to be served! Our first tipple was perfect for this particularly hot Philly summer night. The effervescence of the soda and the floral juniper notes helped to keep things light, with the honey tempering the vodka. Citrus from lemon and bergamot was a nice complement to the light, fluffy bergamot diplomat cream and honey buttercream interspersed within the lemon cake. The fresh honeycomb topping was definitely a nice touch! Big fan of Tanqueray No. 10, with it being distilled with citrus. This lent itself to meld nicely with the notes from the vinegar "shrub" that's all the rage these days. Dry vermouth helped to bring just enough booze back to enjoy with the bursts of sweet richness from the cardamom crumble atop the light vanilla cake. A gorgeously ripe strawberry with edible gold leaf helped to bring this over the top. For obvious reasons, the savory "intermezzo" course was my favorite of the night. Let's start off with what should easily be one of Cake Life's signature items! Forget bagels, eat choux puffs with your morning coffee. 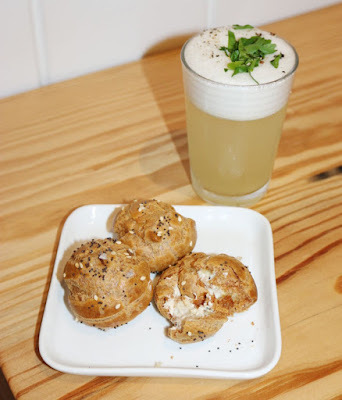 Emanating the best bite you've taken of an everything bagel with cream cheese, the savory caramelized onion-herb cream was a burst of joy within the puffs. The soup of the day was perhaps MacDonald's most technically intriguing and creative cocktail of the night, with the spice of the rye lightened by the lemon and dill. Egg white was set nicely with some olive oil, with some parsley and black peppercorn atop. Expectedly, things took a subsequently sweet turn with a rustic almond galette, nicely crusted with plenty of sugar. A bourbon caramel sauce was glazed over and provided a nice interplay with the bourbon cocktail. 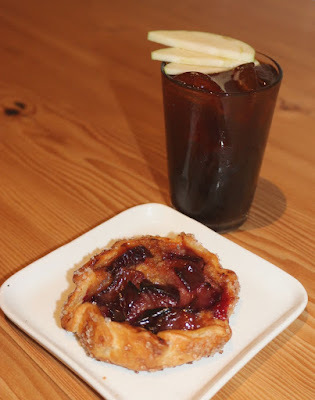 Featuring Bulleit and an apple and molasses shrub, it's clear why apple pies and bourbon caramel go so well together! 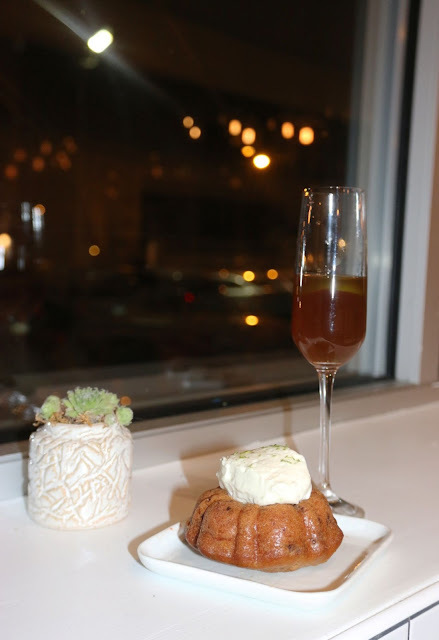 And when I thought I couldn't have another bite, the finale came in the form of a rum-soaked chocolate chip baba au rhum that was moist, but with a bit of heft. It was paired with a cocktail centered on Zapaca 23, which features a blend of rums aged from 6 to 23 years. Certainly had more complexity beyond raisins and butterscotch. Served room temperature, the Earl Grey essence was allowed to shine through and was a nice way to ease into the summer night. And before you leave, Cake Life & Digeo was great about ensuring that everyone was fully capable of getting home, fully plied with plenty of booze and sugar. And of course, because we are talking about Philly's own Cupcake Wars winners, Lily & Nima sent us off with some cupcakes to enjoy! 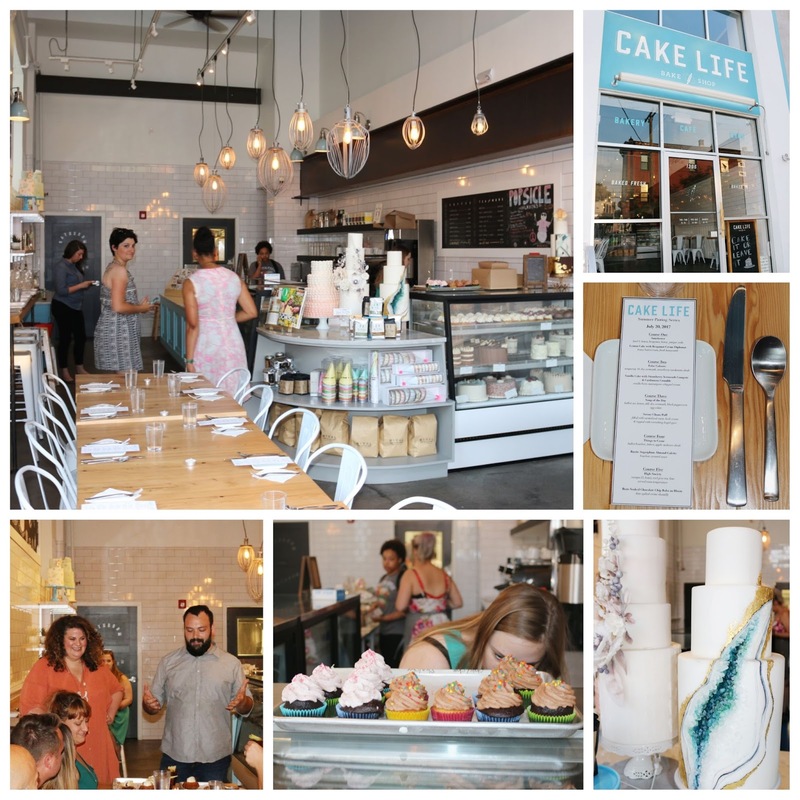 Cake Life's Summer Dessert & Booze Pairing is certainly a great event to come with your friends, but is also a wonderful way to meet new ones! It was great seeing Stacey from PhillyStory again and was a pleasure meeting Christine from PhillyFoodnatic and Annabelle from AisWallAdventures! It was also this bourbon fanatic's joy to speak with Diageo Reserve's consultant, Rachael Ewing, as well! Pro-Tip: Cake Life is BYO! 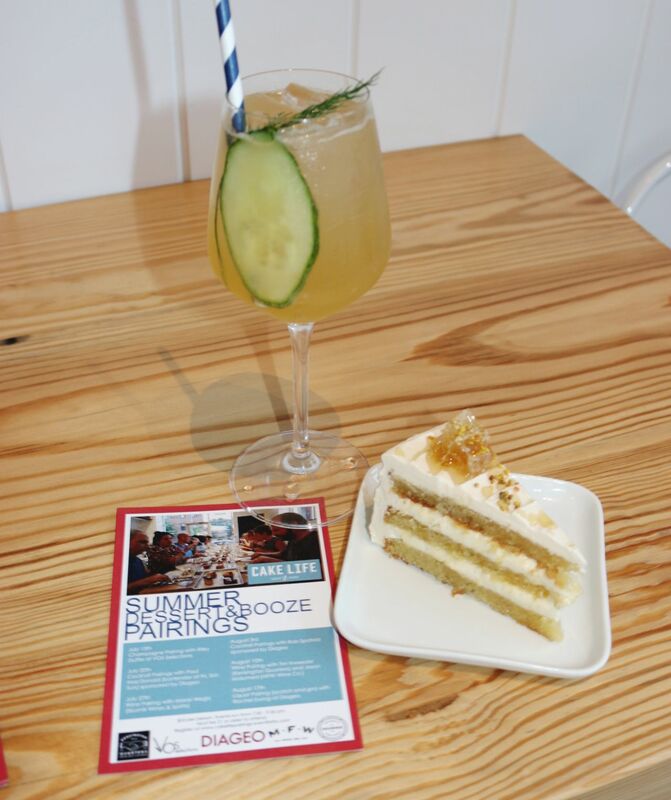 If you're unavailable for these summer pairings, bring your favorite bottle and ask for the perfect dessert pairing! FTC Disclaimer: Thanks to Cake Life Bake Shop & Bondfire Media for having me. Regardless, my opinions are mine alone and, therefore, unbiased.